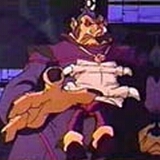 Gannon, who was voiced by Len Carlson, is the master of evil on Hyrule. Before he is given the Potion of Power he looks quite weakly but turns into a powerful, gigantic hoggish mage as soon as he drinks it. 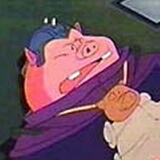 He doesn't like to work with others and refuses to obey Mother Brain, showing his power when he throws King Hippo and Eggplant Wizard, as well as Mother Brain herself, through the ceiling of the chamber he is held in and off to an unknown destination.